​​CNC Rescue, founded by Greg Bean in 2001, was established to repair machines. Greg indeed came to the “rescue” of machine shop owners who were manufacturing critical parts, in an environment where a down machine meant lost revenues and missed schedules. Greg learned the machine repair trade from the best. He worked as a Field Service Engineer for Mazak for a number of years. Armed with skills he learned in the Army, particularly in the field of metrology, the transition to Mazak as a Field Service Engineer came naturally for Greg. After four years, Greg had the skills he needed to open his own business, which he named CNC Rescue. Greg’s selection of equipment for his new machine shops certainly didn’t hurt the acquisition of new customers, either. 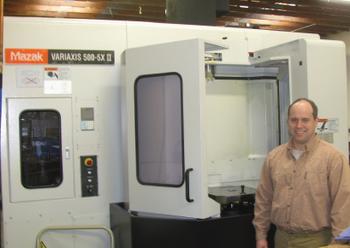 “I jumped right in with the best”, Greg said, “with the purchase of a Mazak Variaxis 500-5X, a 5 axis vertical machining center. My philosophy was to build superior high end products for my customers, and to do so I knew I needed the best machines. Mazak was the obvious choice.” ​Not only is the Mazak the absolute best machine you can buy, it was important that the dealer I was purchasing from was knowledgeable, responsive, honest, and just does what they say they will do. Smith Machinery has all of these qualities. Greg elaborated that the highly-rigid, built-in tilting rotary table, unique to the Variaxis Series, allows work pieces with complex contours and features to be finished in just a single machine setup. It has tremendous weight capacity and will increase machining accuracy while reducing cycle time. 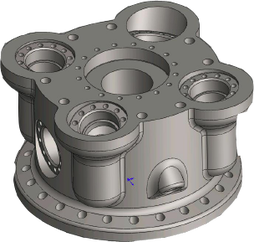 5-axis, simultaneously controlled machining with Variaxis is ideal for aerospace components as well as prismatic parts in steel and aluminum. Greg credits the acquisition and retention of his customers in the defense, aerospace, electronics, and oil industries with his early decision to purchase superior Mazak equipment. ​Nearly ten years in business, CNC Rescue is still solely a Mazak shop with 4 machines. In fact, while the majority of the industry “hunkered down” in 2009, Greg Bean purchased a Mazak Variaxis 500-5X II. “It has a pallet system that allows us to run production -- to run 24x7 unattended”, Greg said, “and it affords us a bigger tool magazine and the latest in controls”. Greg runs a lean, tight operation at CNC Rescue, and with his background as a Field Service Engineer, Greg says, “Our Mazak machines rarely go down, but when they do I almost never call Mazak for service”. All maintenance and repairs are performed by Greg, and this is just one example of how the company contains its costs. The result....2008 was a banner year for CNC Rescue, and then 2009 trooped 2008! CNC Rescue is as adept at building parts that are as small as 1 millimeter to molds that are as large as 14"x 20". Greg elaborates, "The mold was a composite layout tool for a Head and Neck Device for racecar drivers, termed a HANS device and it was so large that it took up the entire mill. Greg Bean, who returned to the Army in the National Guard, did so to pursue a long life dream and to take on a new uncharted challenge-to fly. He is a licensed helicopter pilot today and has even flown Apache Helicopters from Utah to Arizona on several occasions. Greg seeks new challenges always...it's just part of his DNA, his make-up. First the Army, then Meteorology, then Mazak field Service Engineer, then business owner and then the pilot. Fast forward, ten years in business. I asked Greg what was next. "I want to move from the manufacturing parts to manufacturing finished products", he said. For more information on CNC Rescue or the soon to be released Bean Firearms’ AR15, call 801-266-2261. I am sure you will not be disappointed with either choice. With CNC Rescue and Bean Firearms you get Greg Bean. You get excellence, you get superior equipment, and you get a bold, creative innovator, one who always strives to achieve then next challenge. For information on Mazak, call Smith Machinery Co. at 801- 263-6403 or go to smithmachinetools.com.